If our main adrenalin activity - Paintball is not enough for you, try another one - QUADBIKING! Tame a machine which has a power, handling and fun like a motor-bike but it´s stable and easy to operate like a car. You don´t need any driving licence or experiences, just sit, crank it up and go! Every day, April to November, always BOOKING REQUIRED. Site closed if bad weather conditions (rain, mud or snow). Our track is located within the Armypark Orechov. The track was designed considering a general public use so it is conceived more as a recreation, not racing, making it easy for everyone. It consists of many different bends, ridges and mounds with a total length of approx. 400m. A parking lot and pub on the spot. A crash helmet, gloves and fuel as well as briefing and supervision are included in the rent you pay. Borrowing a coverall for an extra fee of 100 CZK / person possible. Do you have a child younger than 16? Never mind! 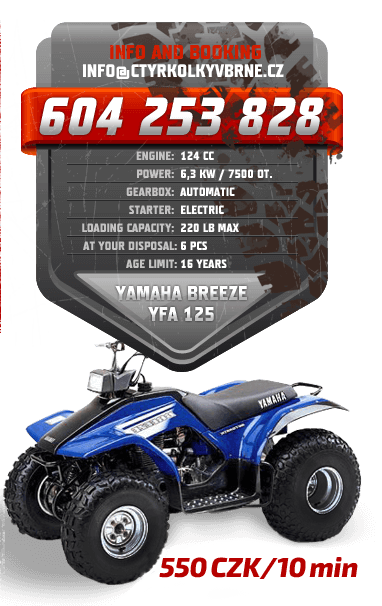 A small quad SUZUKI LT50 is ready for your need as well.